Amazon.com Price: $16.19 (as of 02/04/2019 14:00 PST- Details)	& FREE Shipping. If you’re interested in migrating to Australia and you want a comprehensive overview of the Australian visa process, then this book is for you! Sunshine and Subclasses is your essential first step on the road to Australian migration. 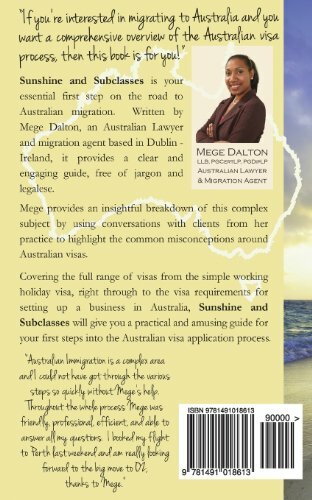 Written by Mege Dalton, an Australian Lawyer and migration agent based in Dublin – Ireland, it provides a clear and engaging guide, free of jargon and legalese. Mege provides an insightful breakdown of this complex subject by using conversations with clients from her practice to highlight the common misconceptions around Australian visas. Covering the full range of visas from the simple working holiday visa, right through to the visa requirements for setting up a business in Australia, Sunshine and Subclasses will give you a practical and amusing guide for your first steps into the Australian visa application process.